About 8 hours after I arrived home from France (I got in around 2 a.m.), the Baltimore Area Boardsailing Association was holding the annual Gerry Brown Memorial Regatta for Cancer Research. This is a fun one-day regatta held at the Baltimore County Sailing Center at Rocky Point Park in Essex, and the official season opener for the BABA summer regatta series. Basically the deal is you put $10 or more in the kitty for cancer research, and you get to have a few races with your friends. It's a win-win situation. Luckily we had some nice, hot weather, which I was really ready for....and no wind, which I had about enough of, but luckily I don't have to sail the RS:X. The best thing about the BABA regattas is that there is a big local longboard fleet, which means I get to break out the old Mistral One-Design for fun light-wind racing. There are a variety of boards in the fleet, including Equipes, F2 Lightnings, more One-Designs, Fanatics, and one or two that must be at least 20 years old but still work great. 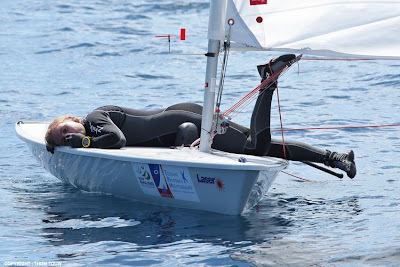 Although I was completely exhausted still from Hyeres, I got to use all the pumping technique I had worked on so hard. Plus, all the shifty Chesapeake wind makes for some great no-stress tactical practice. I had to find all the pieces to my board before the race, and luckily I had put everything together in my parents' basement so I didn't have to look too hard. The track was sticky, so I borrowed some silicone lubricant and sprayed it down. Unfortunately the silicone became like an oil slick all over my deck as soon as a few waves washed over my bow....so I was sliding around my board a lot during the races! Most of the silicone slick did end up washing off by the final race. To add to the equipment entertainment, I was using an old sail with a really stiff mast because my best gear is now in Europe. During the last race I noticed a 4-inch slit in the main panel of the sail, near the leech. I wasn't sure how it had happened, but for a moment I thought that it would be a great idea to file for redress. To my vast disappointment, I had won all the races so it wasn't necessary after all. For most of the racing, the wind was 3-5 knots. Puffs were coming down on the left for most of the races, but the starting line was favored near the boat end. During the last race, the wind went right and eventually shifted south for the afternoon. A great regatta was had by Colin Pitts, who smoked most of the fleet on his Equipe and gigantic 11.6 Formula sail. A few members of the fleet had consistent results, while others were getting warmed up and had finishes in both the front and back of the fleet. A notable improvement in the last race was made by Fan Pat, who had struggled near the back in a few races. She had a solid start on top of the fleet and clear air the entire race, and finished third. Overall the regatta was really enjoyable for everyone. Many thanks to the race committee, Marc Rosen and Aimee, for running four good races, and to everyone who helped organize the event. The forecast for the last couple days of racing had been changing all week, and nobody was sure what exactly would happen with the wind. In the morning, the wind was offshore, strong enough to sail. The committee sent all fleets out, and ran a sequence for the gold fleet. After their start, the wind went south in a more typical “sea breeze” direction, making the committee reset the course. After more than an hour’s delay, the women’s fleet started. We had two races in pumping conditions once again, which were exhausting. The men’s fleet went in after their two races, and a third race began for us. During the racing the wind was up and down. A few downwind legs, girls were planing, but overall the wind was still about 5-7 knots. The wind began to go right, back to the offshore condition, during the last race. In classic style, as soon as the final race concluded, the wind came in, bringing planing conditions and lots of hot air from the land. The next day the long-awaited breeze finally came, just in time for the medal races. The wind was about 20-25 knots out of the south for the boards. We observed from the coach boat as the races were run. The chop was so big that the big committee boat lost control while it was anchoring, and everyone on board was working really hard to get the anchor in and set again. It took a few tries to set the course. In the men’s medal race, Julien Bontemps (FRA) set an early lead and maintained it to win the race, but lose the regatta by one point to finish second overall. Shahar Zubari of Israel, not as strong of a sailor in heavy wind, finished seventh in the medal race but had built enough of a lead to win the regatta. In third, with a very consistent overall performance, was Nick Dempsey (GBR), following the leaders by a 13 point gap. Ricardo Santos (BRA) and Piotr Myszka (POL) finished a strong second and third in the windy medal race. During the women’s race, the Spanish sailors had a hard fight. Close in points during the regatta, Blanca Manchon won the medal race to take a place on the podium, beating 2008 Olympic 4th place finisher Marina Alabau by a single point. The Chinese sailor, Peina Chen, built enough of a lead to maintain her first-place position although finishing 6th in the medal race. In second, with a second place finish in the medal race and an overall very consistent performance in tough conditions, was Bryony Shaw (GBR). Overall, my finish was disappointing but I accomplished some goals for the season quickly. With the help of our coach, and some agreeable conditions, I cleaned up my light wind technique a great deal and am pleased with the result. One of the most challenging aspects of the Hyeres regatta is always the weather. The European spring in South France can bring stormy, cold, and windy weather; the Mistral wind (an intense 40+ knot drainage wind caused by a high pressure system over the north Atlantic and a low pressure system over the Mediterranean), and in between, sunny weather and light wind. It’s a little early in the year to have a well-established sea breeze here, so without the storms, we’re left with a very unstable, light wind. In addition to the weather, we are sailing in the middle of a bay with the breeze coming over tall mountains, and our course is very close to land. This week has been a classic example of this unstable pattern. The strange springtime weather in South France delivered more of the same light wind today. The day was sunny and very hot, and the whole morning the sea was glassy. Committee boats were sitting in clusters waiting to set marks, and all the boardsailors were beached and trying to stay out of the sun. It was a long and tedious day of waiting, but we finally sailed two races, leaving the beach around 4:30 p.m. In these conditions, sailors with the best light-wind boatspeed are really rewarded. In non-planing wind with random gusts and shifts, maintaining excellent speed is very difficult. In these developmental days of my technique, my efficiency is less than some of my other competitors. I’m working as hard, if not harder, than the other sailors, but I’m not getting the same output from my equipment. However, I have made significant progress in my technique, and this early in the season that is the most important goal, rather than seeing results. I’m very happy this regatta has been so light…and we’re looking forward to more of the same tomorrow! Once again light conditions prevailed in Hyeres, with a 6-7 knot northwesterly breeze. The morning was sunny and warm, seemingly perfect for a sea breeze, but the afternoon brought a layer of clouds and the offshore conditions maintained. For most of the day, the wind was too light to race the boards. Mid-afternoon the two men’s fleets started, trying to get races in to finish their qualifying series. The girls had two back-to-back races after the first start of the men’s fleets. The offshore wind was very shifty and throughout the afternoon there was a general trend of the right side of the course being favored. As the day grew later, the wind dropped off a bit until the last race was 4-5 knots. I had a better day today, as I am finally figuring out pumping technique upwind. I’m finally able to put my strength to good use, and it’s a great feeling. I had a couple really good upwind legs in which I made up ground against competitors with boardspeed. Again, I am meeting goals for this year during this regatta, so my sailing is right on target. Leading the women’s fleet is still Israel’s Maayan Davidovich, who after one throwout is ahead by six points. She is followed by Blanca Manchon (ESP) and Flavia Tartaglini (ITA), who are separated by only two points. In the men’s fleet, the lead has been taken by 2008 silver medalist Julien Bontemps (FRA), who has yet to score lower than third in any race. With two bullets today Shahar Zubari of Israel (who won bronze in 2008) has moved into second place, and Piotr Myszka (POL) is now in third. We are looking forward to more breeze tomorrow, and a little rain. We may never see the windy conditions that south France is famous for during this regatta, but it’s good and challenging racing all the same. I woke up to the sound of rain this morning. Spring in France means a lot of crazy weather, and today was no exception. The morning was windless, chilly, and wet. We started on time however as lines of clouds were bringing breeze and more rain. The men’s yellow fleet and women’s fleet were first up. Our first race took place in about 8 knots of breeze, which progressively shifted left during the race and became lighter and lighter. The second race started in about 5 knots of wind, which died to virtually nothing. By the second upwind everyone had resorted to row pumping. We weren’t quite spinning in circles, but were still barely making progress. Girls were catcalling the race committee, trying to get them to shorten the course or abandon the race. The course was eventually shortened, to our relief. After just barely making two races, the men’s blue fleet was sent out. Luckily another line of clouds had come in, generating enough wind to get two starts off. We remained postponed on the beach, waiting for a third race, until the wind completely died and racing was abandoned for the day. Each fleet now has three races. Leading the women’s fleet is still Maayan Davidovich (ISR), now closely followed by Peina Chen (CHN). In third is young Italian Laura Linares. The men’s fleets are now led by Piotr Myszka (POL) who scored another first and a third, Julien Bontemps (FRA), and Andreas Cariolou (CYP). I’ve been accomplishing my goals for this regatta: learning light wind pumping technique and staying positive. It is a great start for the season and I’m looking forward to the rest of the regatta. Light and shifty winds dominated the race area today, leading to a long and tedious day for most sailors. By late morning, a seabreeze of around 5-7 knots developed and the boats were sent to their courses. The RS:X women had the third start, after 2 fleets of men. After one general recall, we were able to start one race. The wind became progressively lighter throughout the race and extremely shifty. Eventually it went right, but during the last upwind, there were big shifts and boards gained and lost position radically. It was a difficult race for all the competitors in the dying wind, and the committee shortened the course by a leg in order to finish in time. In general, difficulties abounded today as the fickle wind caused many delays. We were sent ashore after one race, and after waiting until late in the afternoon, we were sent back out again. The girls once again had the third start, and the wind began shifting and dying during our sequence. The start was postponed, and eventually we abandoned for the day without racing a second race. All the sailors were out until around 6:30 p.m. However, some of the boats, especially the Lasers, had an even longer day. They were still on their course long after the boards had come home. Leading the racing in the men’s yellow and blue fleets are Liwei Wu (CHN) and my Trials coach, Piotr Myszka (POL). In the women’s fleet, Maayan Davidovich (ISR), Blanca Manchon (ESP), and Hei Man Chan (HKG) are top three. Our coach Christoph and I have been working on improving my pumping technique in light air. I have plenty of power, but it’s not being translated to the sail. I’ve been doing the same thing for years and although I have gotten some input previously, I’ve never been able to actually feel the correct technique. Now we are making some headway, and it will be interesting to see my progress during the next few days of expected light wind. Note: as of now, my website is under construction. Hyeres, France, has been my favorite venue on the European race circuit since I first raced here in 2006. The springtime in south France is absolutely beautiful; trees and plants are brilliant green and the weather is mild (but can be unpredictable!) I arrived two days ago and am staying with friends in a perfect, picturesque hillside French village, 25 kilometers from Hyeres. This will be my fourth French Olympic Week and it’s great to be back doing what I love the most. 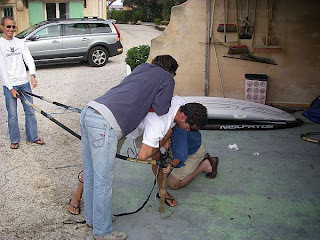 How many sailors does it take to fix a boom head? Ben, Christoph, and friends at work. This year, the US boardsailors in attendance (Ben Barger and I) have a coach for the regatta. Our coach is Christoph Sieber, an Austrian boardsailor who won a gold medal in the 2000 Sydney Olympics. He is friendly, humorous, and knowledgeable, and we are already off to a great start. Today we had our first practice session and an organized practice race. We practiced pumping technique both upwind and downwind, and also worked on reading the shifts, figuring out their pattern going upwind. About half the fleet turned out for the practice race. Halfway through the men’s start, the wind went from 8 knots to about 3-4, and there was a huge shift to the right. The start was abandoned and the committee reset the course. Starting a practice race, especially in virtually no wind, is always difficult. Most of the sailors end up being over early. In my case, I held my position on the line up until the last 15 seconds, when some girls aggressively went over the line and I slipped back. However, I tacked away, found a great lane of clean air, went straight to the favored side with good speed and had a solid first upwind. It was a promising start to what is looking like a light air regatta. The weather is fickle this week in Hyeres and today was sunny with very light wind. However, there have already been thunderstorms, cold weather, and lots of rain this month. Currently there are a few different areas of low pressure and fronts hanging around over south France, and it is forecasted that most of this week will be light wind. Developing skills in light wind is a focus for the season, so I’m happy with light wind, but the weather here could change at any moment. We’re all looking forward to an interesting week on the racecourse.